The market opened the week with positive sentiments in continuation of the relief rally of previous week. Sometime during the middle of the week, Chinese market fell by more than 6% and US market fell by 1.38% but Indian market stood resilient and did not succumb to negative sentiments in the international markets, a positive sign of decoupling. It looks like the market will sail on its own strength going forward and discount the quarterly numbers. HDFC Bank reported 20% rise in Q3, HDFC reported 7% Q3 rise, Maruti at 27% Q3 rise, Glenmark 48% Q3 rise, Godrej Consumers 18% Q3 rise, Colgate 22% Q3 rise, Dabur 13% Q3 rise, but ICICI disappointed with just 4% rise in Q3 on higher bad debt provisioning, Vedanta reported 99% drop in profits on account of lower base metal prices. FIIs sold approximately stocks worth Rs 12000/- Crs in the month of January whereas DIIs made a total purchase of Rs 6000/- Crs. The markets have stabilized, valuations are attractive, quarterly numbers are not significantly bad as expected and therefore going forward markets will rise rewarding those investors who kept patience and sat tight on their investments. TRAI has recommended base price of Rs 11400/- Crs for 700 MHz, the most efficient spectrum band which is nearly 4 times costlier than the 1800 MHz bands which were auctioned last year, potentially threatening the health of Telecom companies which are already over burdened by huge debt. This kind of telecom policy does not augur well for the long term shareholders. New IPO of Precision Camshafts, priced aggressively has received muted response as there was little margin of safety for investors. The sharp reversal of Nifty50 from 7241 levels indeed was solid for the markets to sustain upward momentum. The intermediate term bottom is in place. In its upward journey the market is likely to test resistance at 7600 on the upper side from where some profit booking is expected. However it is expected that these levels will be breached and market is likely to go back to 7900 to 8000 zone. Shorts must be covered and long positions can be initiated from traders’ perspective. Markets however continue to make lower tops and lower bottoms, from the medium term perspective. The rally is expected to gain momentum with bouts of profit booking. Traders should buy on dips and Investors can add on to their portfolio of quality stocks and keep patience and hold on their investments. The market opened the week deep in the red whacking Mid-cap stocks which hitherto were resilient in the downfall. The front page media headline "Bear hug tightens", "Sensex slides to 20 months low", "China, FED and crude oil brew a perfect storm leading to emerging market selloff" caused the eventual capitulation and in turn sowed the seeds for the bounce back. Pessimism was at its peak and therefore the reverse was inevitable in the form of swift bounce back rally. Dollar has appreciated to 68 levels causing lot of anxiety to unhedged importers and borrowers of forex loans and at the same time showering bounties on the exporters. Corporate results were muted but expectations were met. HCL Tech reported 0.2% Q3 PAT rise, Axis Bank reported 15% Q3 PAT rise, Kotak Bank 32% rise in Q3 PAT, RIL with 39% rise in Q3 PAT. FIIs still continued with their selling spree by selling shares upwards of Rs 3000 Crores for the week while DIIs were net positive buyers for the week. The markets are stabilizing and will slowly decouple with international news events and will sail under its own weight of robust fundamentals underlying the Indian economy. Govt has announced the much needed sops for the Start Ups to turbo charge the entrepreneurial spirit in the country which necessarily is the single largest engine for creating massive employment opportunities in the economy. Ambani brothers signed the pact for telecom businesses for sharing infrastructure and spectrum on mutually beneficial terms for the benefit of both the companies an indication that good times have arrived for them, as their flagship companies had earlier underperformed since last many years. A new record low price of Rs 4.34/- per Kwh was quoted by a Finnish company for 420MV solar power generation for the Rajasthan government potentially heralding a beginning of disruption of thermal power generation where in the unit selling prices are being matched by the solar power generators too. 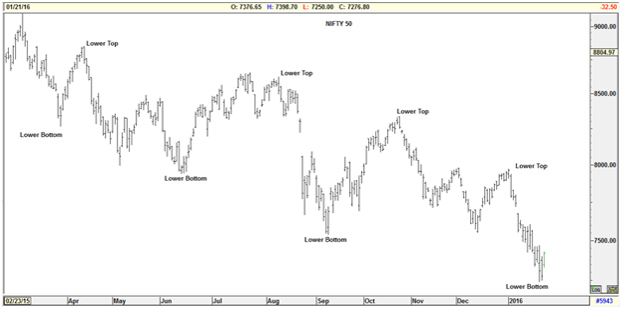 Nifty 50 hit a panic bottom at 7241 and rebounded with a vengeance. 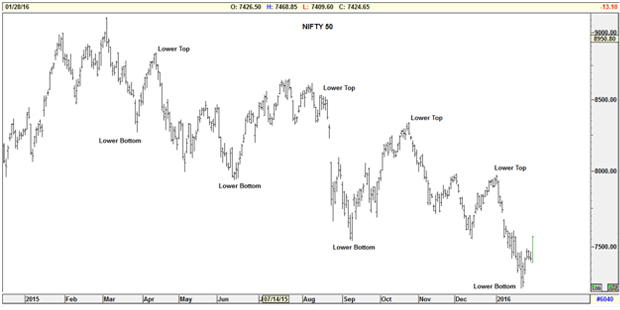 The down fall of three weeks coincides with the previous time cycles of the downfalls and therefore the bottom formation at 7241 looks solid and is of major significance. Market is likely test resistance at 7550 on the upper side. Breaching of these resistance levels will propel markets to higher orbit, firming bulls grip on the market. Shorts must be covered and long position can be initiated from traders’ perspective for short term horizon. Markets however continue to make lower tops and lower bottoms, from the medium term perspective, the structure of the market is still down. The rally is expected to continue in the short term. Investors should keep patience and hold on to the quality stocks. The market opened the week with fear of a complete collapse in stock prices due to an international downward spiral across all equity markets. Fundamentals or rational thinking are side stepped when fear grips the market. Epitome of greed lead to bull market tops and fears of panic lead to market bottoms. The market is witnessing fear psychosis of disproportionate intensity now which can be compared to disproportionate greed in 2014 when the landslide victory of a single largest party was celebrated. The pendulum swings from greed to fear and back to greed in a never ending succession. The reasons of fear may be different every time in the history, the PIGS crises and huge default lurking on the economies of Portuguese, Italy, Greece, Spain and break up Euro or for that matter this time around the concerns of Chinese Yuan devaluation and the slowdown in their economy, the underlying result is the same, it is this fear that drives away bulls from the markets when in fact it is the best time for them to be in. India is a much more resilient and robust economy with growth levers in place it just needs time to show the results. India is on a tipping point to deliver accelerated earnings growth through economic expansion which will eventually get reflected in the stock prices in the long run. IIP numbers for the month of November 2015 were negative 3.2% vis-à-vis last year mainly due to different festive months, however increase in CPI to 5.6%, an increasing trend since last five consecutive months is a cause of concern which could delay the interest rate reduction till the numbers get muted. Government is in the final stages of getting Rafale deal done, one of the biggest in defense totaling Rs 60,000 Crs with adequate offset clauses to benefit Indian companies. Unitech ltd key employees were send to jail for default in delivery of properties, potentially sending a clear message to the real estate sector that times of consumerism have arrived. This incident will go a long way in rebuilding the consumer confidence in the industry. Nifty 50 hit the key support areas of 7550 and breached it decisively by closing the week at 7438. The market is testing the powers of bulls and bears which can be visible by huge volatility in the intraday movements. If the market stays below 7500 for some more time, it would then spell trouble for the bulls as the downward spiral will resume again. Shorting opportunities can be explored in sectors like metal, highly indebted and cyclical stocks with proper risk management. The market continued to make lower tops and lower bottoms. The double bottom of previous week has been most likely breached and the market is heading south in the medium term however a bounce may come in the short term. Investors should keep patience and hold on to the quality stocks. The market opened the week deep in the red in response to the Chinese stock market locked at the lower circuit. Financial markets all over the world responded negatively in sync with the Chinese mayhem while Gold rose, due to investors looking for a safe heaven. Base metals and crude oil too had a free fall on fears of a hard landing in China. FIIs continued their negative stance on Indian equities by selling shares upwards of Rs 1000 Crs however after a long time DIIs fumbled for the first time this week by not making aggressive purchases, leading to free fall in the market. Such type of herd reactions are often short lived and the market soon starts on its own trajectory based on its inherent fundamentals. Each economy has its own good and bad phase, India however is on a much a stronger footing considering its scale and size of the economy which eventually will get reflected in the stock prices in the long run. IRB Infra secured a Rs 10,000 Crs order to build a tunnel to connect Leh, the largest order coming from the new government kick starting the investment cycle in road sector. New launch prices of properties in Mumbai are 20% less than the previous year heralding an era of beginning of increased sales which will restart the growth in the sector. HDFC is in the process of raising Rs 5000 Crs for real estate ventures is a loud indicator that the real sector is back on the radar. Nifty 50 hit the resistance level of 8000 and reversed its up move in the short term. Due to overnight events, the index fell sharply to hit 7550 levels within a span of just 4 days. Such precipitous fall can break important support levels. However till the time market finds its levels, it can be safe to stay on the side lines. The market continued to make lower tops and lower bottoms and on the last count a double bottom. It needs to be seen whether the double bottom is breached decisively or holds good. If 7550 levels are broken the markets can go lower for some more time. Traders are advised to wait and watch where as investors should commit purchases. The market opened the week in positive territory and remained upbeat inspite of holiday moods. FIIs have started to buy with net positive inflows since last two weeks after many weeks of strong outflows. DIIs have remained aggressive buyers all throughout the year in 2015 having invested record $10.9billion against $3.8billion in the year 2014. FIIs have invested only $2.9billion in 2015 against whopping $16billion in 2014. Companies raised Rs 13,866 Crs through IPOs in 2015 against just Rs 1,468 Crs in 2014. AUM of Mutual funds crossed $63.82billion in 2015 against $51.6billion in 2014. Indian Rupee was the most resilient currency amongst the emerging market pack which yielded 2.57 % p.a. in dollar terms post interest, however other emerging market peers like Brazil and South African Rand have given negative 20% returns. Structurally the India story is still intact but because of global liquidity outflows the markets had delivered muted returns. The resilience of the Indian Rupee will hopefully bring back foreign liquidity in droves driving stock prices to higher orbits as India has the most reliable and stable, diversified economic expansion in the making. EssarOil ltd finally completed the delisting process by accepting minority shareholders bids at Rs 262.80/- a premium of 80% over the floor price. Jaypee group finally puts its’ entire cement portfolio on the block for an estimated enterprise value of Rs 19,000/- Crs in the quest to reduce debt. Government has simplified environment clearance norms for the real estate sector giving them much needed reprieve from red tapism and increase the ease of doing the businesses. 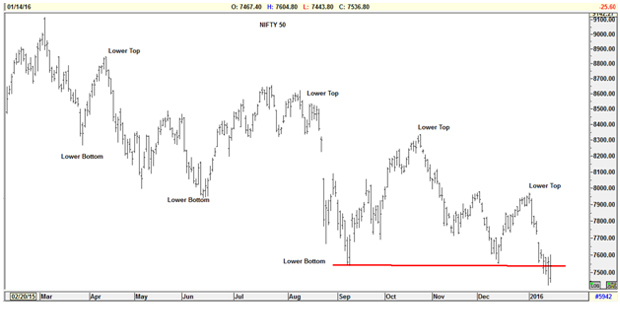 Nifty 50 has been rising continuously after hitting strong support levels of 7550. The bounce of 350 points within a matter of two weeks was swift and therefore it’s time for some corrections. There is strong resistance at 8000 levels and some amount of profit booking is expected at these levels. However breakout above 8000 would be a strong signal of the resumption of the uptrend at least for the medium term. Nifty 50 is expected to cross the key resistance levels soon. Traders are advised to take long positions on dips whereas investors should stay fully invested in quality stocks. The rise in front line stocks and indices continued this week as well. The bounce of the previous week testing important support levels has slowed down albeit indicating profit booking can set in for the coming week. The rollovers of the open positions were below average indicating lackluster movement for the initial part of the next week. The market will await cues from the international markets for its direction once the financial markets reopen from the Christmas holidays. The market will start building hopes on the budget and the reform agenda of the government for the year 2016. We hope this New Year our Parliament functions normally and pass laws on merit after constructive debates in the larger interest of the nation. Markets are expected to be range bound with some amount of profit booking to happen though the under current is still strong. Nifty ended the week up by 1.27% to close at 7963.20 We wish all our esteemed readers huge financial prosperity in the coming New Year.